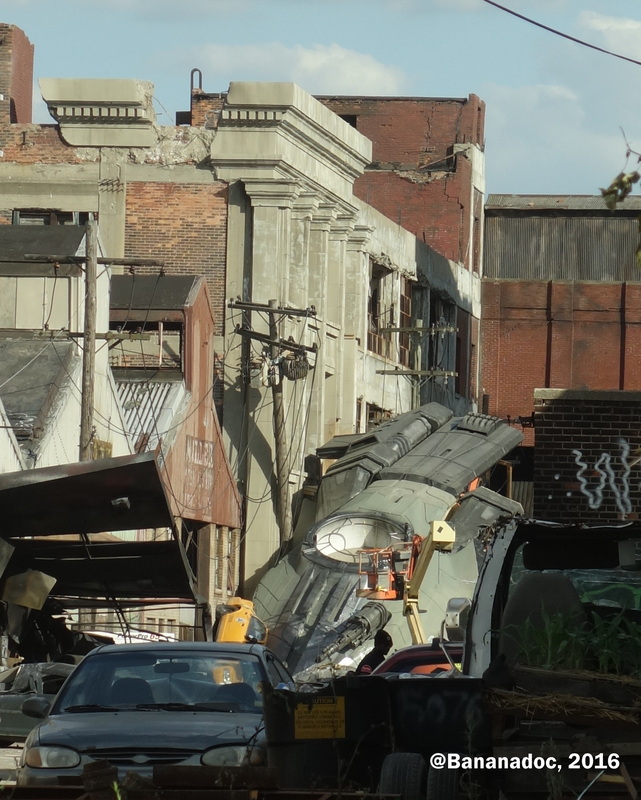 Filming of Transformers 5 in Detroit began on Monday in some of the streets near the Packard Plant on the East side of Detroit. One of the things film makers must love about our city is the ability to close down several blocks for several days and have no one care! 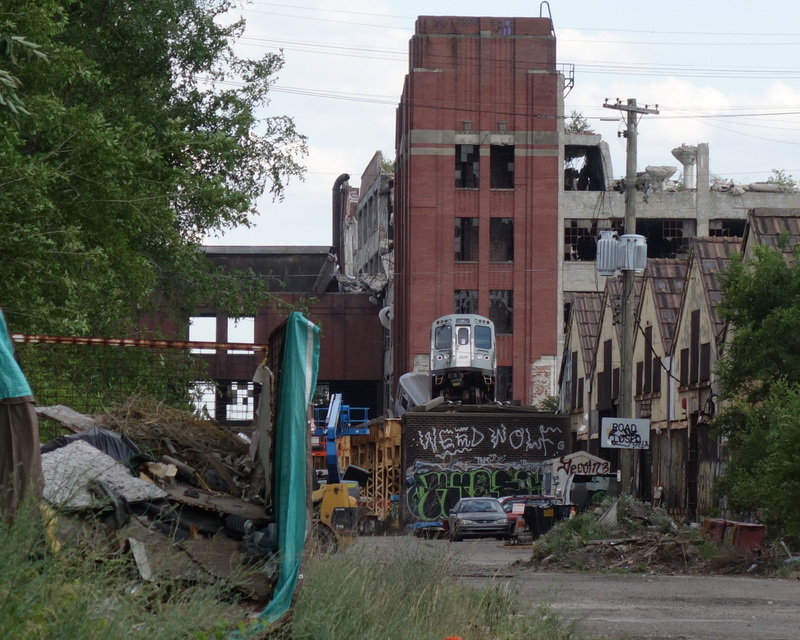 This is an area of the city that is pretty much blighted, with burned out buildings and a definite post-apocalyptic feel. There are no crowds watching the filming. Roads are blocked for some distance around the set and there’s literally no one there. If they move to shoot scenes in downtown of course that will change, but out there, they can shoot for days without having to shoo away the star-struck public. These vehicles (or parts of vehicles) are nearby at the side of the road. 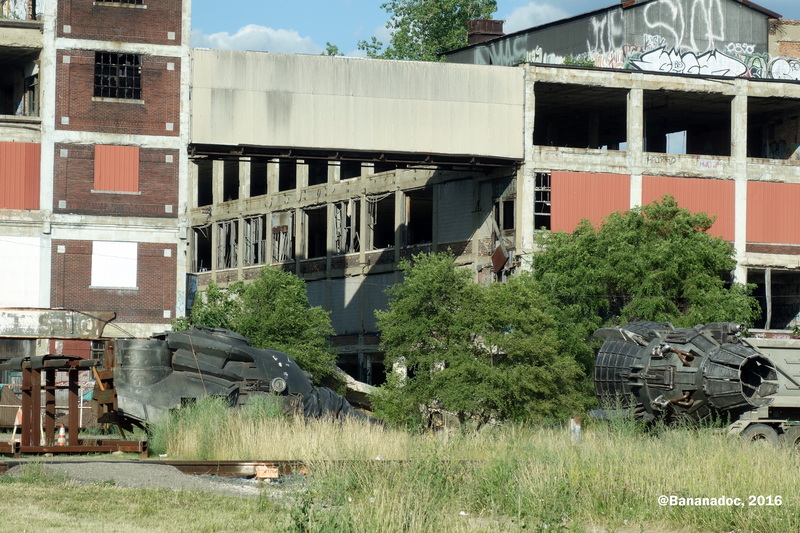 You could easily drive by and not even notice them because they do seem to blend in with the dereliction of the old industrial facilities around there. Around the corner, hidden in one of the old factories is a set that they must have been working on for some time, again without anyone even noticing. 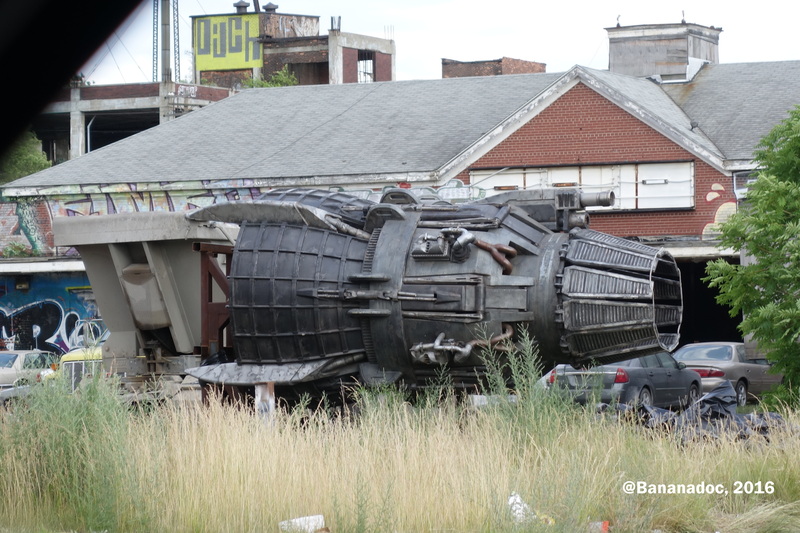 When I heard that Transformers 5 was coming to town I had hoped they would build an elaborate set like the one for Transformers 4, which was right in downtown. Detroiters watched that set under construction for weeks before it was finally blown apart by Michael Bay’s pyrotechnics. 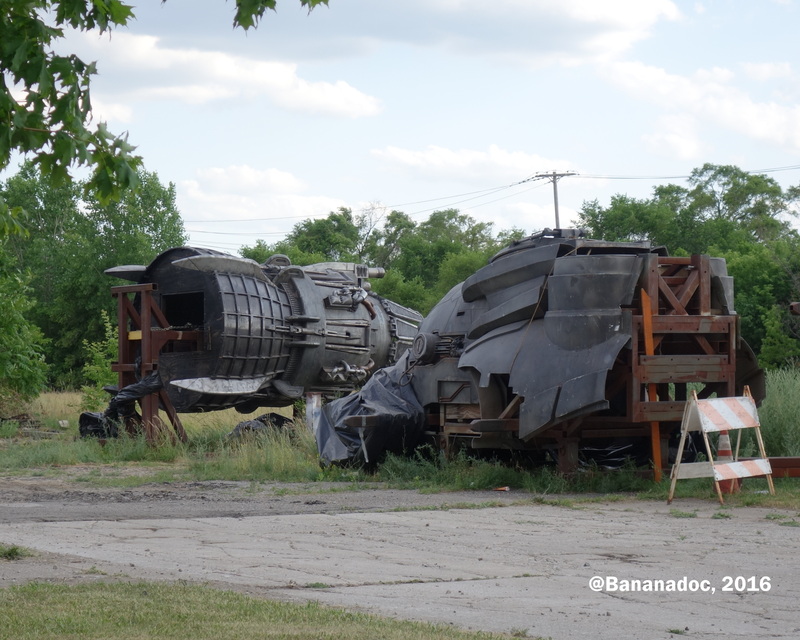 Not so this time, and if the bulk of the action is to be filmed at this location, we won’t be able to see much if anything. That’s disappointing. Watching the Hong Kong set come to life from a vacant city lot week by week was spectacular. This set looks interesting, but there’s obviously a lot of detail in there that we won’t see until the movie comes out. 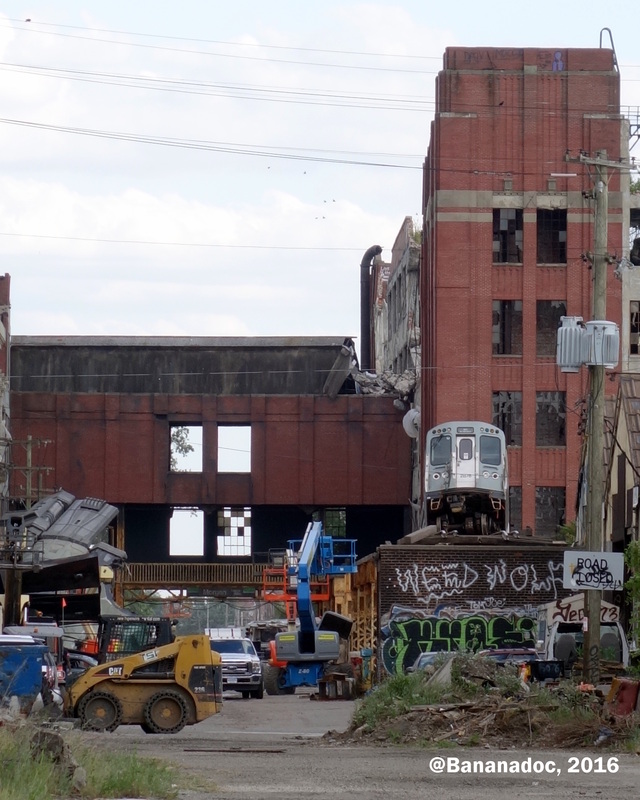 At first glance it could be just another decaying industrial complex, but when you look closer there are some things that don’t quite belong! There’s a train in there. A wrecked train and it’s higher up than a train should be. Michael Bay does enjoy wrecking L-trains in his movies. That old factory building now has some strange Gothic pillars and architectural details on its facade that shouldn’t be there. An upside down yellow cab. Oh wait. Is that a space ship? Why, yes it is! There’s still work to do here, and there’s no word yet on when filming will take place, but it’s possible no one will notice that either! Pretty cool. I only *just* read that they will be filming here :).